The upper part of the flexible corner blade is installed on the moldboard and the lower part to the outermost polyurethane blade holders. If the main blade hits an obstacle during plowing, the lower corner blade installed to the blade holders will move backwards together with the main blade and facilitates moving over the obstacle. 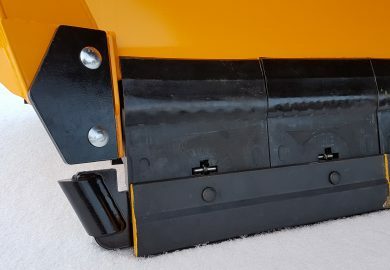 The flexible corner blades can be ordered as additional equipment for highway snow plow models (MSPN).